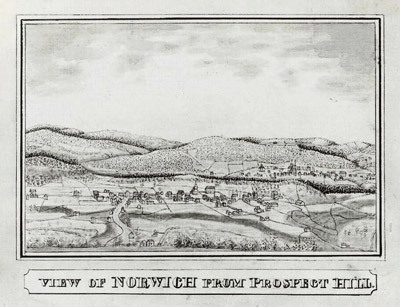 In 1824, Edwin Ferry Johnson, a young cadet at Alden Partridge’s military school, hiked up Norwich’s Prospect Hill, plunked himself down and drew a detailed pen and ink sketch of Norwich with Hanover in the distance. The drawing includes the South Meeting House, which later became the Congregational Church, and Alden Partridge’s American, Literary, Scientific & Military Academy, which became Norwich University in 1834. Johnson’s sketch shows a prosperous village that had seen its population grow from 1,158 in 1790 to 2,316 in 1830. Wool production, apple growing and farming were fueling the growth. A toll bridge to Hanover was built in 1796. 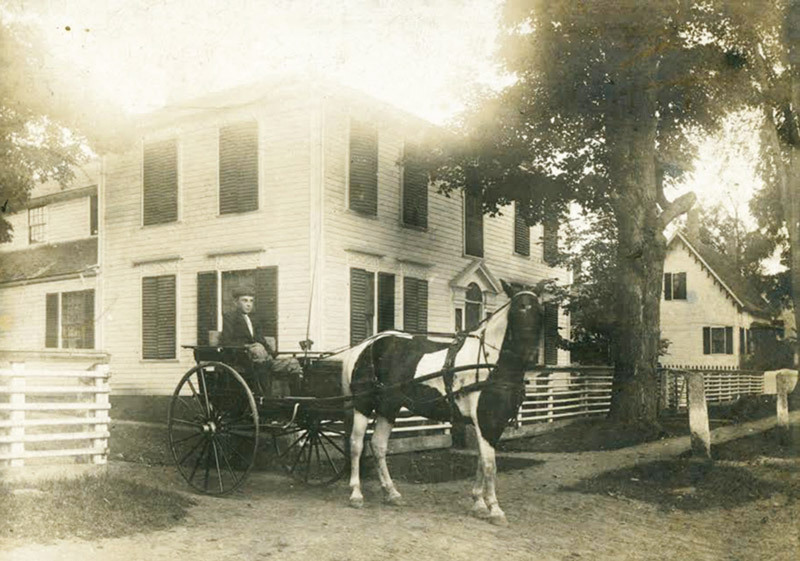 A year later, Jasper Murdock built his elegant home that was both a stagecoach stop and tavern near the corner of what is now Beaver Meadow Road and Main Street. A post office opened in 1805. 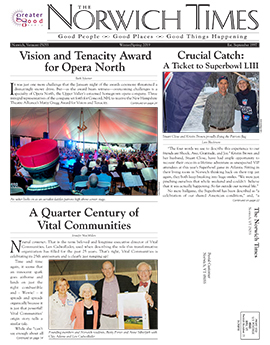 The village was thriving; into this development stepped the Emerson family from Westfield, Massachusetts. From the day they first arrived, Elihu, Joseph and Thomas Emerson and their cousin, John, worked in the community as merchants, speculators, smithies, farmers, builders and town officials. Acting singly or together, the Emersons invested in many properties, including a 100-acre lot of two thousand apple trees. Mr. Emerson was a sturdy New Englander. He outlived his first wife and then also his second wife who died when she was eighty. 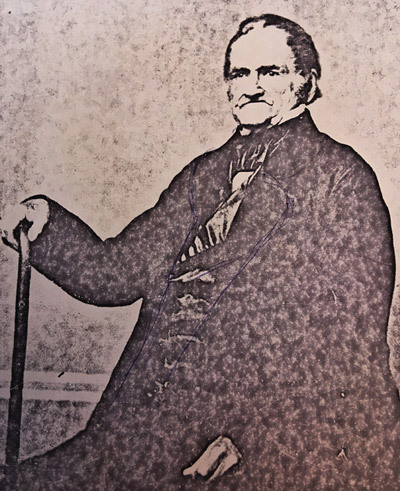 According to one story, Elihu, who was considered quite agile his whole life, placed his hands on his horse’s back and mounted “thereon from the ground on his seventy-first anniversary of his birth.” Elihu died at his daughter’s home in Leicester, Mass in 1873 at the “advanced age of over one hundred and two.” His remains were returned to Norwich and placed in the Fairview cemetery near his brother Joseph’s grave. Joseph was “engaged considerably as a builder”—and considerably is the word. Following the construction of his own home he built “The Partridge House” on Main Street. Now a B&B, the house is an impressive brick structure. Next time you walk by, take a look at the doorway and the triple window above the door which is “…itself treated like a doorway with sidelights and elliptical fanlight.” Joseph also built the third brick house on the left as you enter Norwich and probably had a hand in the building of his brothers’ homes. One of the striking features about the brick houses built in Norwich between 1810 and 1830 was the beautiful color of the brick described as “a warm soft red, almost a salmon-pink.” These bricks were made in a brickyard located on Blood Brook near the intersection of Main Street and Route 5. In all probability, the Norwich brickyard was the earliest brickyard in this region. The Emersons left their mark on Norwich in more ways than one. Today, if you have the time to stroll down Main Street you can still see many of the structures that Edwin Johnson sketched in 1824. If you look closely at the drawing, you can pick out Elihu Emerson’s blacksmith shop and the home he built in 1820. And, further still, you can spot Joseph’s home on Main Street and Thomas’s home which is on a diagonal from the South Meeting House. With a savvy eye for style and sturdy building, the Emersons set the standard in Norwich for home construction. Their legacies are with us today, two centuries after they were constructed. Many thanks to Nancy Osgood for her detailed research on the Emerson family. To learn more about the early homes of Norwich be sure to attend the House and Garden Tour, “The Art of the Past: A Stroll Down Norwich’s Historic Main Street” on June 23rd.